Viewing the Chicago rapper’s new visual at work might just get you fired. CupcakKe has always said she's "the most explicit" but her new video will put any doubts to rest. The "Duck Duck Goose" visual features the Chicago rapper showing off an extensive collection of dildos as well as a souvenir Statue of Liberty. It's pretty wild and definitely one to watch outside of office hours. Zip up your duck costume and check it out above. 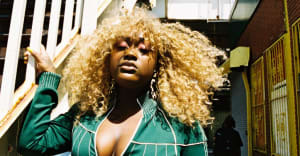 “Duck Duck Goose” appears on CupcakKe's latest studio album, Ephorize. The 15-track follow-up to last year's Queen Elizabeth was released earlier this month. The Chicago rapper also recently featured on Charli XCX's Pop 2.